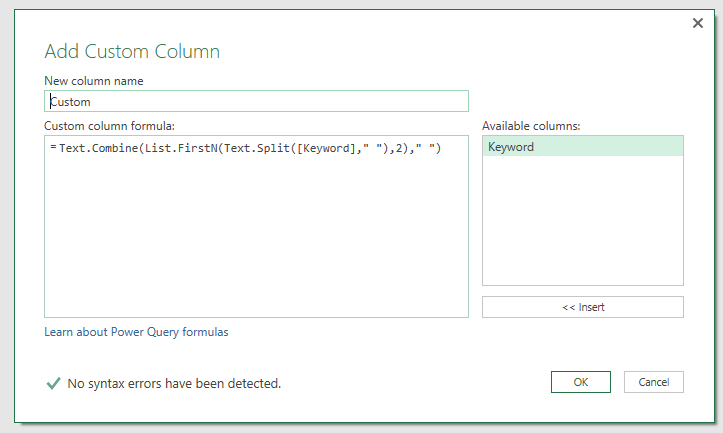 List functions can become your favorite set of functions if you often need to manipulate text (aka “keywords”). 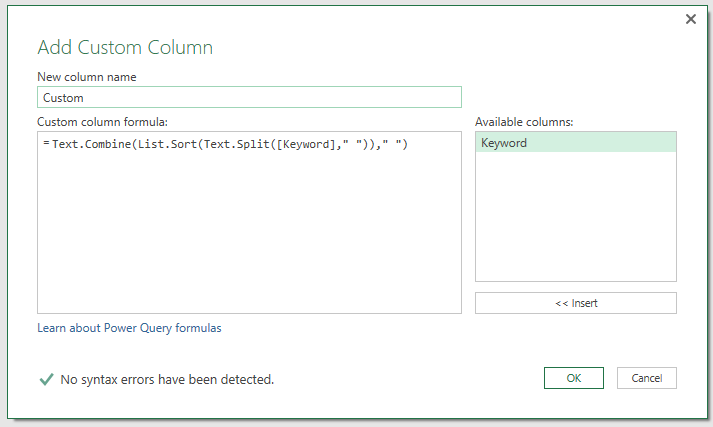 You are now probably wondering what “list” function even means in Power Query. Basically, a “list” is a special object whose elements can be easily manipulated separately. Text.Split function converts text to list. First argument is the text which needs to be manipulated, usually a column. The second argument is the delimiter which will be used for splitting the keyword into the list of words. So it needs to be a space in our case. 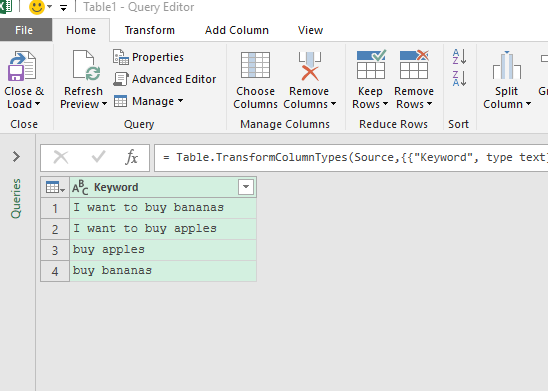 How does it look in Power Query? Updated on 2017-09-30: To be on safe side, you may want to Text.Lower() function first so all the text in [Keyword] is converted to lower case. Cases matter in e. g. in List.Sort function which will be used later. The function would then be written as Text.Split(Text.Lower([Keyword]),” “). 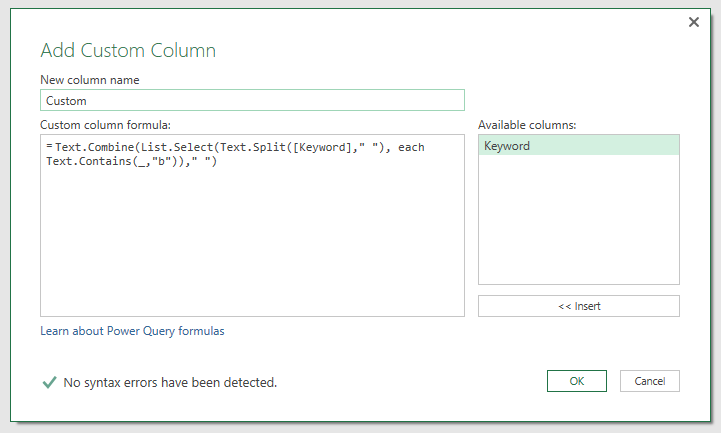 As usual, you are adding a custom column. What is the result? Now, you are able to manipulate all these items in each row via list functions. 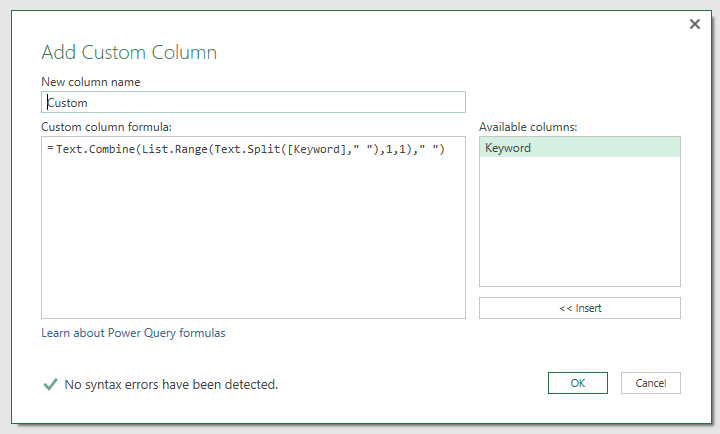 The full list of list functions is here. 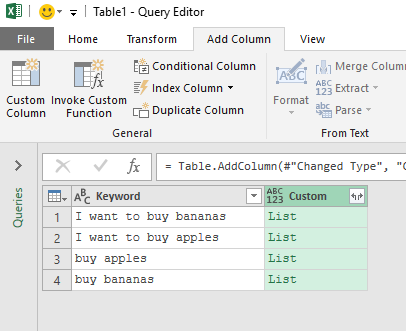 Text.Split splits the keyword by spaces. List.FirstN with 2 in argument selects the first 2 items from the list. 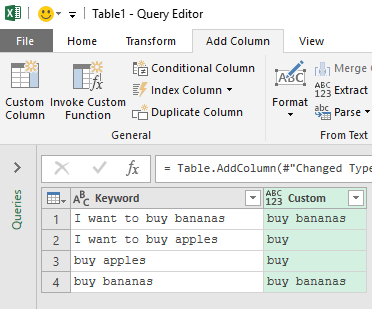 Text.Combine joins the selected words back to “text” by using space. The tricky part here is the List.Range function. List.Range will select items starting at Xth offset. Note that counting starts at 0 offset, not at 1! That’s first argument. The second argument is used to tell how many items from the Xth offset to select. In my case, it is just 1 because I want only 1 word. The important piece here is the List.Select where you need to define the condition for selecting the right words. 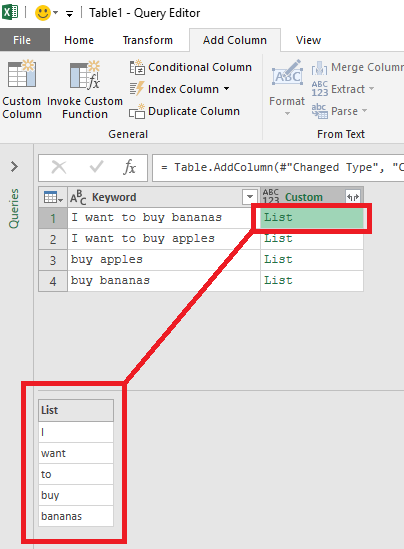 Don’t forget to use “each” and “_” to tell Power Query that it should operate over the “just created list”. Yes, this will be similar as the previous example. The only piece which needs to change is the “Text.StartsWith” part to “Text.Contains”. 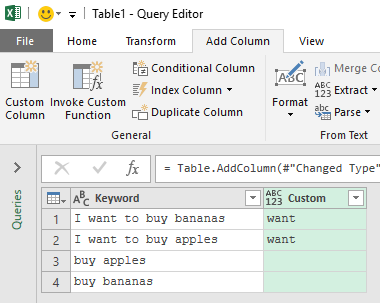 List functions are super powerful functions to manipulate text within “cells”. 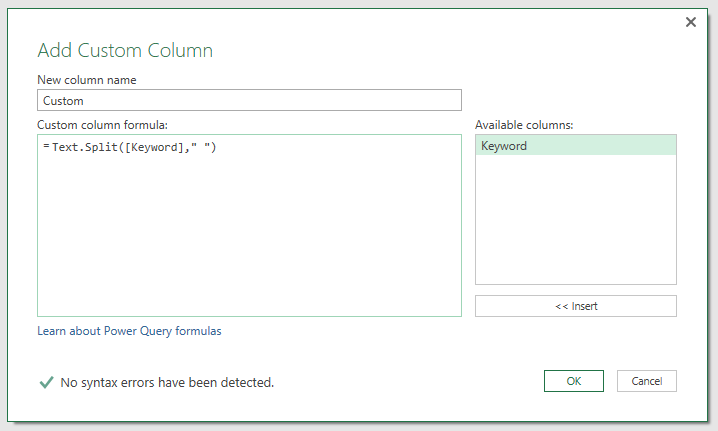 If you passed your “Power Query beginner” stage, definitely start learning List functions. The sample file with all the functions applied is here. Great post! I really like the way you lay out the info and really go into the detail of why it’s doing what it’s doing! At first thought that is not alphabetical, however after searching I find that List.Sort, sorts first by Upper Case, then by Lower Case. Glad you find it useful. You are right, it did not occur to me when writing the article but I also tend to use Text.Lower(column) just to be on the safe side when working on real projects. I will update the article.